Sent in by visitors to this web-site. Bake Sales are an easy way to raise funds for all sorts of good causes. They are also a neat way to include as many people as possible in your fundraising activities and allow as many people as possible and easy way to contribute. Below are some great recipes sent in by other visitors to this site. Why not send in your own favourite recipe to include on these pages. Its really easy to do. Simply follow the instructions below. And what a nice thought; that your Granny's recipe for Coffee and Walnut Sponge, or Cousin Janey's Shortcake Fingers could end up helping charities and non-profit organisations all around the world. We are after recipes for cakes, pastries, cookies, biscuits, home-made sweets or anything else that you have discovered to be a surefire winner at your fundraising events. We particularly welcome recipes and photos from junior bakers so come on kids.... tell us all about the things you have been baking for the School Fair or Youth Group Summer Fete. 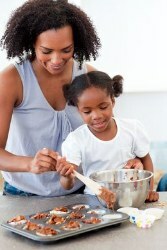 Do you have a great recipe for cakes or cookies that always goes down well at Bake Sales? Or do you know an easy recipe for kids that means they can really take part and get involved......and produce something edible! Send it in to us and we will add it to these pages. Do you have a picture to add? Great! Click the button and find the right one on your computer. Select it and click on the button to choose it.